Happy Monday everyone, I hope you all had a fantastic week and are excited for the week ahead, I know I am! And why’s that? Because it’s time for my 2nd Annual #HolidayDoubleSlay look book. If you are new to the blog since last year you are in for a jammed pack week of fashion, fun and friendships so hold onto to your seats and stay tuned. Today’s first look features one of my favourite brands, ELOQUII and our new addition to the group this year, Gail Thompson, one of the 4 fierce ladies behind the blog Fab Four Fashion, a blog that focuses on providing options for the slim, tall, curvy and plus woman. As a fellow plus size gal, Gail also is a huge fan of ELOQUII so it made perfect sense that we highlight some of their fierce Holiday options together. I love the concept that Gail and Fab Four have brought to the blog arena because it is truly representative of size diversity. You have a group of women who are friends, who have grown up together, but all with very different body types. But week after week they show us that there are truly fashionable options for every women regardless of your size and shape. And they provide us with recommendations of brands that are truly size inclusive, I love seeing a post where they are able to wear the same brand because I think that is the ideal goal, the idea that anyone from a size 0 to 32 can shop together at the same store or with the same brand. Fab Four Fashion started their blog a few months ahead of me so we have had the opportunity to support one another as we grew and developed our brands. These ladies have a zest for life that is infectious and their bond is like a sisterhood. I admire how supportive they are of one another and how you will find all of them supporting one another on individual projects. And the ladies who aren’t plus size are super supportive of our community and can be found at many body positive events. And I personally couldn’t be more grateful of their support for my blog! I have always enjoyed spending time with Gail because she is funny, smart, kind and has a smile that lights up any room. But at the same time she is a no nonsense woman who isn’t afraid to speak her mind and tell it like it is, all qualities that I respect and can relate to. We are also both in our 40’s so we can relate on what it is like to navigate the social media landscape for our generation. And you probably don’t want to get either of us started on the notion of “dressing for our age” because we proudly wear what we want, despite our age! Finally Gail is a size 22/24 so she can relate a little bit more to my personal struggles as a size 26/28. When it comes to style, I think that Gail and I have pretty similar tastes, I often see us commenting on the same looks on social media and I love that she is not afraid to take risks. She loves the glam and the sparkle like I do and I have to admit I am envious of her ability to wear the killer heels that she does lol. Gail, thank you so much for agreeing to be a part of this project! It was a blast to shoot with you and your energy was amazing. You nailed this look so much, I kind of think I need it for myself! If you want to see more of Gail’s fabulous style and her review of her look, please be sure to check out Fab Four Fashion and also her personal Instagram account, MizWooChic. There is actually a little bit of a funny story about me and this dress. As you may or may not know, ELOQUII continues to work very hard to offer more and more of their styles up to a size 28 and their end goal is to be able to offer everything up to a size 28. I have been very supportive of them as they work on this goal as I understand the commitment they are making, particularly from the economic perspective. As a smaller brand, they have made so many strides in increasing their offerings compared to other major brands. 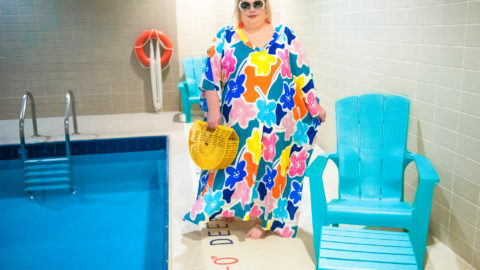 Their very first swim line was completely available in sizes 12 to 28, as was their collab with Katie Sturino as well as their recent NOIR collection. And don’t worry, my thoughts on the NOIR collection are coming to the blog soon. When a new collection is launched I do spend some time going through it and seeing what is offered in my size and what isn’t. Inevitably there are a few disappointments and the team is good enough to hear my opinions which I truly appreciate. So when I saw this dress was available up to a 28 but some other dresses weren’t I was actually quite shocked. I looked at this dress on the model on the website and I was like how is this dress going to work on someone my size. And would my followers or other customers my size think the same thing when they saw it? I have a pretty good ability to look at clothes on a size 14 model and know whether they will work for me or not but I have to say this is one time where I definitely think it helps to see it on someone that is more your size. I also had made certain assumptions about the dress based on the pictures on the website that actually ended up being quite the opposite. Given that I like a challenge and I love to rock something different, I couldn’t help but choose this dress for this project. Yes it was a risk, but if it worked out I knew it would totally be worth it. The bottom line? I absolutely LOVE this dress!!!! I love a classic red dress for the holidays and this is not only the perfect shade of red but it is has the feel and look of a rich stretch satin which is appropriate for so many occasions. I also love the length of the dress, its perfect for a cocktail party or a fancy date night. And the exposed gold zipper in the back is a unique additional touch. I am wearing the 28 in the dress and I think for the fact that it is a form fitting body con silhouette and the fabric has stretch that it fits exactly as I expected it would. I love a peplum because it accentuates the smallest part of me, my waist and also helps to smooth out my hips and stomach. This one definitely has some drama with its extra fold and high low hem. The black velvet belt is the perfect touch to bring that extra drama and additional waist definition to the look. The most interesting part of the dress has to be the draped bodice with its textured layers of fabric and deep v neckline. Based on the photos on the website I was concerned that I wasn’t going to be able to wear bra because it looked really low in the back but as you can see it actually is much higher on me and I had no problem wearing a strapless bra. The top part is a little big so I had to have it tailored but it was a small fix and something I am used to given my shape. 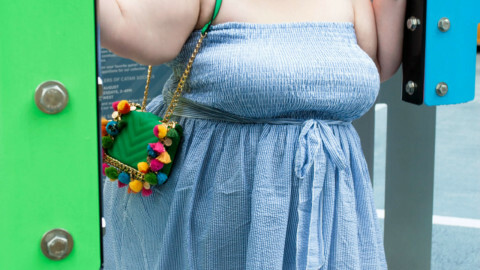 Did you guys know that ELOQUII also offers a great selection of accessories? Both these stunning earrings and this bracelet are also from ELOQUII. I love that they are plus size friendly and they offer on trend pieces. These pieces in gold were perfect for this look. I then added my favourite black patent heel for a classic touch and a sparkly clutch that popped against the red. Remember that you can totally mix your metallics! What I learned from this experience is that you can’t judge a book by its cover and the old adage that you shouldn’t dismiss something based on how it looks on the hanger or in this day in age, the website still is so very true. I would have missed out on this amazing look if I hadn’t take that chance. My first challenge to you from this year’s #HolidayDoubleSlay is to take a chance, try something you wouldn’t normally try, you may just surprise yourself! A special thank you to ELOQUII for providing us with these looks. All opinions are our own.